Do I Really Have To Buy Kleenex So My Kid Can Get A Better Grade? Off-Ramp commentator L.J. Williamson's son, a student in the Los Angeles Unified School District, came home with an unusual homework assignment from his history class: Bring in five boxes of facial tissues. This assignment would be worth 100 points in extra credit. "The soft kind, not the cheap kind," his teacher said. A hundred points is equivalent to a full week's worth of homework. So I wondered: if five boxes of tissues meant 100 points, would 100 boxes of tissues buy us out of homework for a full semester? Imagine the family time we could have! But I knew my son would complain about stuffing a hundred boxes of Kleenex into his backpack, so I started thinking about alternatives. Then I did the math. Assuming 30 students per class, five classes per day, five boxes per student, after this my kid's teacher would be sitting on a mother lode of 750 tissue boxes ? a virtual tissue gold mine. 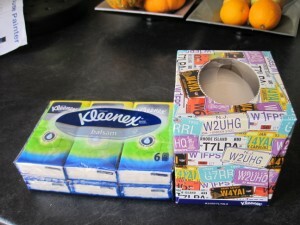 Of course, that assumes every single parent has the time and money to go out and buy the five boxes of tissues. But what about the ones who can?t? When I thought about their plight, I got angry. I wrote the school counselor. "The tissue was for extra credit, not for a grade," she explained. "If a student chooses not to bring in tissue, there is no penalty." She added the teacher "would NEVER tie an assignment of bringing in tissue to a grade. I'm sorry that your son did not relay the correct message to you." But when I pressed, she admitted, "Yes, any extra credit WILL help a student's grade. The teacher asked students to help out because we can't order tissues from LAUSD at the moment." Why can't they order tissues? ?They have changed the way schools order from the District warehouse, and our computers don't support the ordering software.? She guessed that many schools with old computers were having the same problems. So a software ?upgrade? left a number of campuses unable to order supplies ? like tissues. In the middle of cold and flu season. So teachers began bribing students? families into buying supplies themselves. I wrote one last email, explaining that I harbored serious philosophical objections to letting donations impact student grades. It was immoral. It was unethical. And any history teacher should know that trading Kleenex for grades is no better than trading arms for hostages. Then I went to the store and bought five boxes of tissues. In the end, 100 points is nothing to sneeze at.